The August bank holiday marks a tradition for me and a couple of old school friends: four days of long-distance cycling. 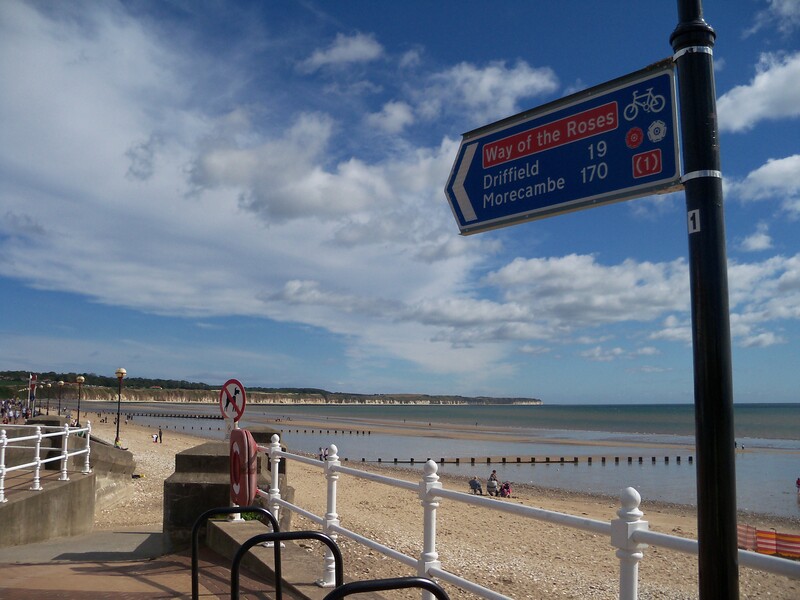 This year we cycled the new Way of the Roses, a coast-to-coast route from Morcambe Bay to Bridlington, crossing the Peak District and the Yorkshire Dales. Normally these things start with a couple of miles through an industrial estate before the cycle path takes us out into the countryside, by which time Jon will have changed his inner tube at least twice and either a tramp will have passed muttering something about lightening coming from the ground or a random man offering to show us a wooden-wheeled bicycle (all these things have happened). Not this time, though. We set off with the bay and a spectacular view out to the Lake District behind us and were quickly off the roads. Our first day’s cycling took us the 35 miles to Settle, and unlike previous rides the hills came early. 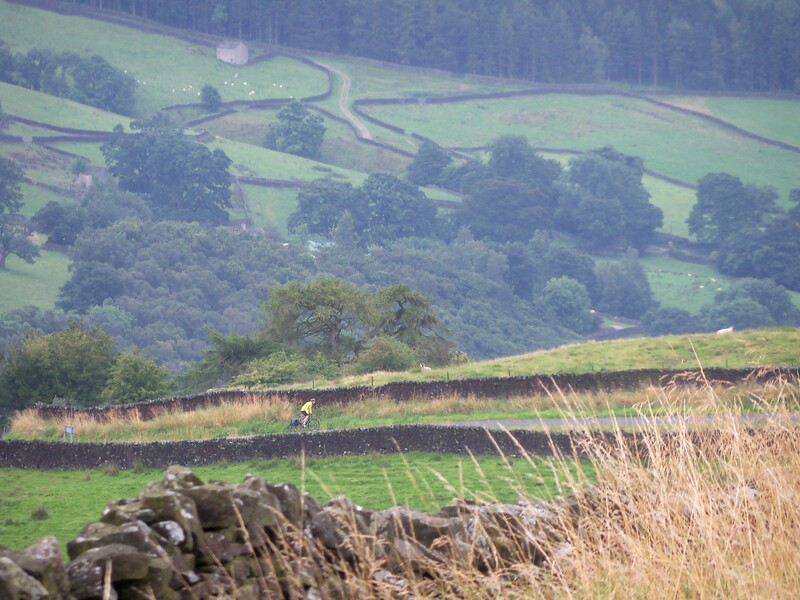 The Peak District, as it turns out, has a well-earned name. Two hills, each between 140 and 160 metres high, stood between us and our hotel, and the majority of the elevation gain came in remarkably few miles. 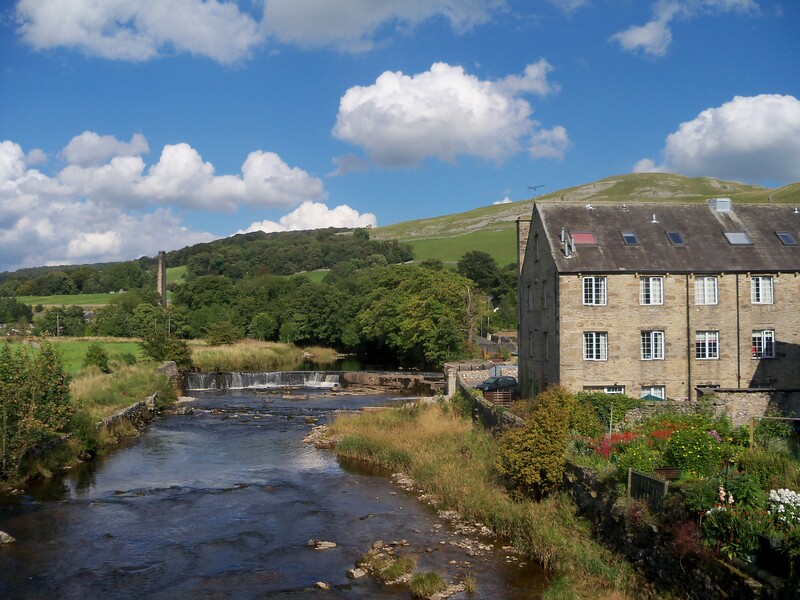 We stayed in a hotel slightly off the main cycle route, but since Settle is such a small town we only had a few yards to stumble in our mini pub crawl before dinner. Fine ales and an epic battle of Tiominoes flowed through the evening, which concluded with agreement that the game was about 50:50 luck and judgement. The next morning, a little bleary from the previous night’s booze, we tucked into a hearty breakfast before getting my saddle fixed (it had come loose on the first day, so I hadn’t been able to sit on it the previous day) and heading off to complete the next 55 miles of our trip. Dave had mentioned that the day would start with a climb. Settle is in a little valley, so the previous day had ended with a speedy freewheeling section, while the tone of day 2 was very much set in the epic climb out of the village. In just a mile we climbed around 130 metres, and the following two miles continued the upwards trajectory. We were soon in the Peak District countryside working our way through tough rolling hills (not big, but steep, and often on hair-pin bends) hoping that the weather wouldn’t close in. We pushed on to our lunch stop at Pateley Bridge as the rain began to set in. Cold, wet and tired, we stopped at a tea room for some much-needed tea, warm lunch and some frankly amazing desserts. Suitably replete, and with no sign of the rain abating, it was time to hit the road – and the hills – again. The theme of the second day was very much hills and rain. 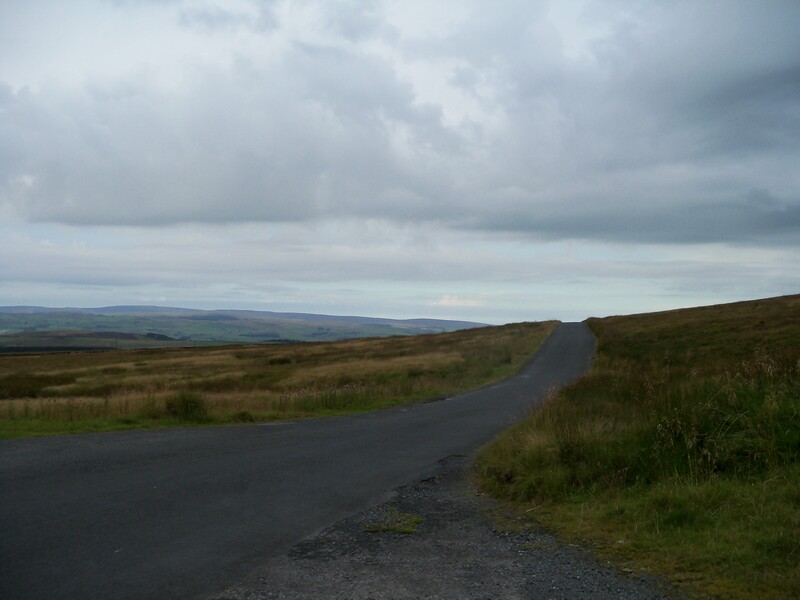 Eventually we had broken the back of the hills – not all up, but the descents were so steep and winding that it was impossible to take full advantage of gravity – and hit the final seven or so miles of flat road between us and Boroughbridge. By this point the rain had started pouring down and we were soaked through and surprisingly cold for August. Fortunately there were plenty of towels and hot showers when we arrived and we were soon able to dry off and sample the bar’s ales. After two days of hills, the third day was our longest distance of around 60 miles – but over flat terrain. We set off in good time, although quite a bit of my clothing was still wet from the day before, despite an attempt to dry it in the Corby Trowser Press over breakfast. Keeping an eye on the weather, since heavy rain was expected at some points in the day, we belted through the first segment of the ride and made it to York by 11. After a short break, and with the weather still holding out, we pressed onwards. However, shortly before we hit our lunch stop the heavens opened again – the rain was even heavier than the day before. My clothes, which had just about dried through, were back to being soaking and I was able to wring great streams of water out of my gloves. The moment we stopped in a pub for some food the rain stopped and the sun came out. Pizza – the only food served in the pub – was washed down with weird multi-layer milky coffee – the only hot drink served in the pub – as we started to drip dry. Then we were back on our way, safe in the knowledge that we had a couple of hours of dry weather before the rain was due to set in. 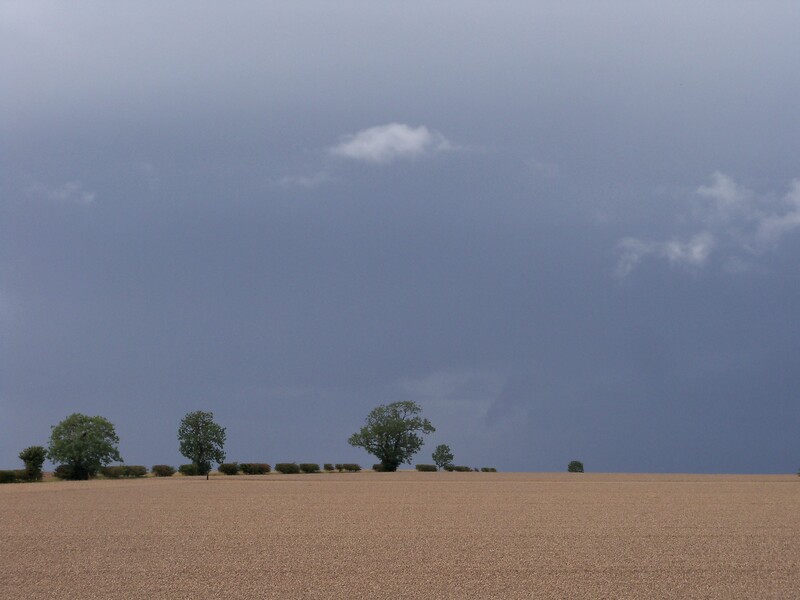 As we cycled, we could see a front coming in from the north, piling high with clouds and leaving the sky a bruised purple that could only mean a deluge. A few flashes of lightening and rumbles of thunder accompanied a heavy cloudburst as we sheltered on a petrol station forecourt. Once the weather cleared again, we set off, keeping an eye on the approaching weather behind us. Some very fruity clouds headed in our direction – what better reason to cycle fast? Before we started the final notable climb of the ride the rain started. We quickly ducked under a nearby tree and another cloudburst hit, sending muddy streams gushing down the road. This time the rain lasted a bit longer, but it wasn’t the main weather front we’d been running away from. Once it let off, we set back about climbing the final hill and getting to our last hotel dry. We made good time to Hutton Cranswick, at which point the front pretty much dissipated and never hit. In the meantime, once showered, we caught the train to Driffield – which we would cycle through the next day – for dinner and drinks. Following the rain of the past two days, the sunshine that greeted us on the final day was a great relief. It was windy and a bit cold, but it was dry – all the more important, since we were catching a train back down to London later that day. Our final stretch was just 24 miles, and so far we had collectively had no bike troubles other then my saddle needing to be adjusted. So, it was pretty much inevitable that with just six miles left of the whole journey that Jon got a puncture (a cycle trip tradition) and I buckled my rear wheel. Fortunately Jon changed his inner tube quickly and I was able to loosen my rear brake so that my wheel could still spin (albeit in a crazy sort of way). And so we made it down to the seafront and the end of the route with a couple of hours to spare. Enough time to find out that the local bike shop was shut on Sunday and Bank Holiday Monday and get some food at a proper seaside chippie. Sitting in a pub (which promised karaoke four nights a week, starting at 3pm) we reflected on a route well cycled over a pint of mild. It was hands down the most scenic Sustrans route we’d taken and the most clearly sign posted (although there were a couple of points where the signage could have been improved). It also contained the most challenging whole day of cycling we’ve endured. All in all, though, highly recommended. My Garmin recorded the route, elevation, etc. here. I’m surprised you made it given your grasp of geography; you were not in the Peak District!